We are your Wireless Experts! For over 20 years Natel has provided Internet access to the out of reach and under-served areas of rural Jefferson County and surrounding areas. Many bigger ISP’s are discontinuing their rural services, or worse yet, increasing their rates because they think you have no other option. We believe everyone deserves access to the information highway and we want to be your option! Natel has Access Points placed strategically throughout Jefferson County and into surrounding counties broadcasting directed wireless signals to our customers’ homes. 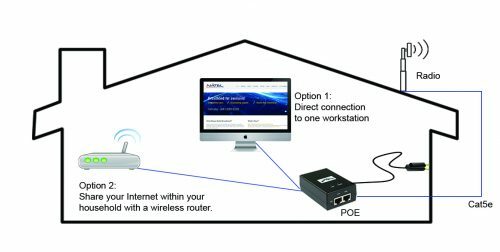 Instead of a Modem, our customers have a small “radio” mounted on the outside of their home with line-of-sight (LOS) to one of our Access Points. Our standard speeds typically range from 2 to 7 megabits/s with faster speeds available via custom quote as it can vary depending on location. Our service is always on – and Natel has never had any cap on the amount of data you utilize! Professional installation includes basic Radio Transceiver Unit (RTU), all necessary hardware & supplies to attach RTU to outside of house, plus an Ethernet cable run from RTU to one location in your home. Any additional equipment required to turn up service – such as higher-power radios/antennas, installation on roof or chimney, or other special engineering – as well as in-house wiring of more than one location will incur additional charges. Standard installation showing 2 internal networking options. Additional wiring to other locations will incur additional charges. Below is our standard pricing for the following areas. Birmingham, Brighton, Fairfield, Libertyville, Lockridge, Packwood and Richland. For other market areas please call our sales team to check serviceability.